Be the first to hear about their new releases and deals. Download the Booksprout app and search for J. Haney today! I was born and raised in Kentucky. I reside in Greenup County, Kentucky with my family. My debut novel, An Unexpected Love, released August 2015. I’m a single momma to my ten year old daughter, Jessalyn Kristine. I also take care and homeschool my autistic cousin, Aiden Sean, he’s ten years old. I love photography and seeing what I can capture through the lens! 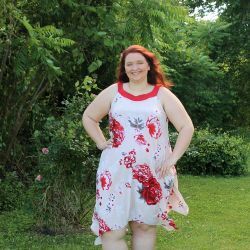 I’ve been plus size modeling for over a year and have been on multiple patterns covers now. Both kids model as well, I suppose you can call us “One Big Modeling Family”. I’m probably the biggest book whore, I know. I love books of all genres and get excited when I’m introduced to a new author. I’m often told I act like a kid in the candy shop, which I could totally see!